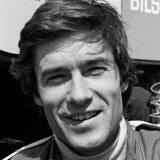 Tiff Needall had a forgettable and brief F1 career with Ensign in 1980 - he retired from his first race and did not qualify for his second. He made a more lasting impression as a presenter of the BBC's Top Gear between 1987 and 2001, when it was scrapped before the current Jeremy Clarkson version surfaced. He went on to present Fifth Gear on Channel 5.